Dip top of cupcakes in sugar, pressing to flatten slightly. Decorate attractively using candies to create tree ornaments. Poke 2 holes in top of each gumdrop using a skewer or toothpick. Cut licorice into 4 (1 1/2" /3.5 cm) pieces. Press ends of licorice into holes in gumdrops to form a loop. 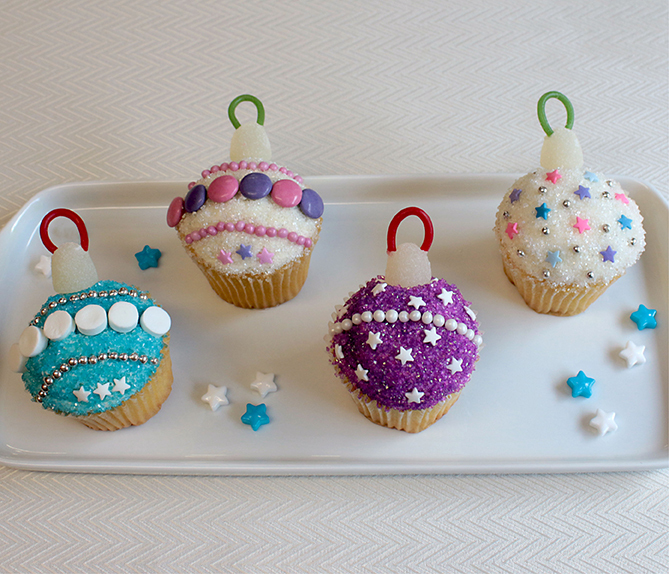 Press 1 gumdrop into top edge of each cupcake to resemble the ornament hanger. Use your favorite colored sugars and colorful candies. Each one can be unique.